Though every musical group thinks they’re “unique”, we believe we’re doing something that no other group is doing, and we’re getting much positive feedback. A chamber trio, we have programs that have been happily astonishing audiences from concert halls to farmers’ markets. A group since 2010, we have been invited back so many times to the same venues that we keep reinventing ourselves with different concert themes, and our email “fan club” and people who have heard us in the past often attend additional performances. 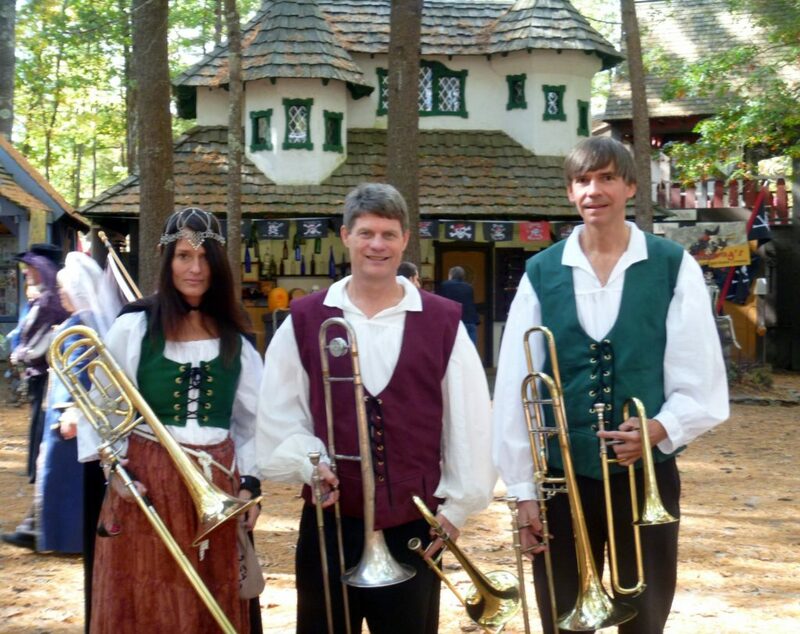 The Solstice Sackbuts perform on soprano, alto, tenor and bass trombones. Check out our different programs. We have fun and educational programs that have inspired audiences at libraries, museums, schools, historical societies, fairs, and assorted concert venues. We were the featured performing group for Trombone Day at Brown University. 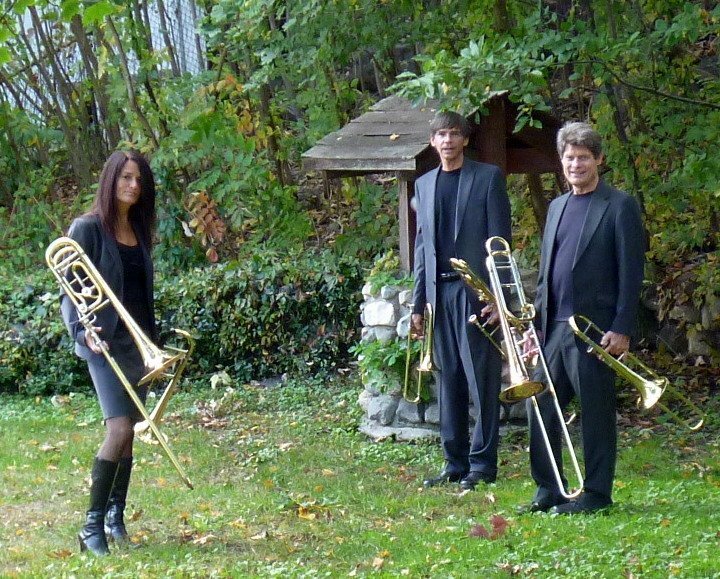 We have “Tree Trombones” for sale and, coming soon, “The Modern Sackbut”. If you’re interested in purchasing a CD or finding out if we’re performing at a venue near you, email us using the form on this website. Though every musical group thinks they’re unique, we believe we’re doing something that no other group is doing, and we’re getting much positive feedback. A chamber trio, we have programs that have been happily astonishing audiences from concert halls to farmers’ markets. A group since 2010, we have been invited back so many times to the same venues that we keep reinventing ourselves with different concert themes, and our email “fan club” and people who have heard us in the past often attend additional performances. 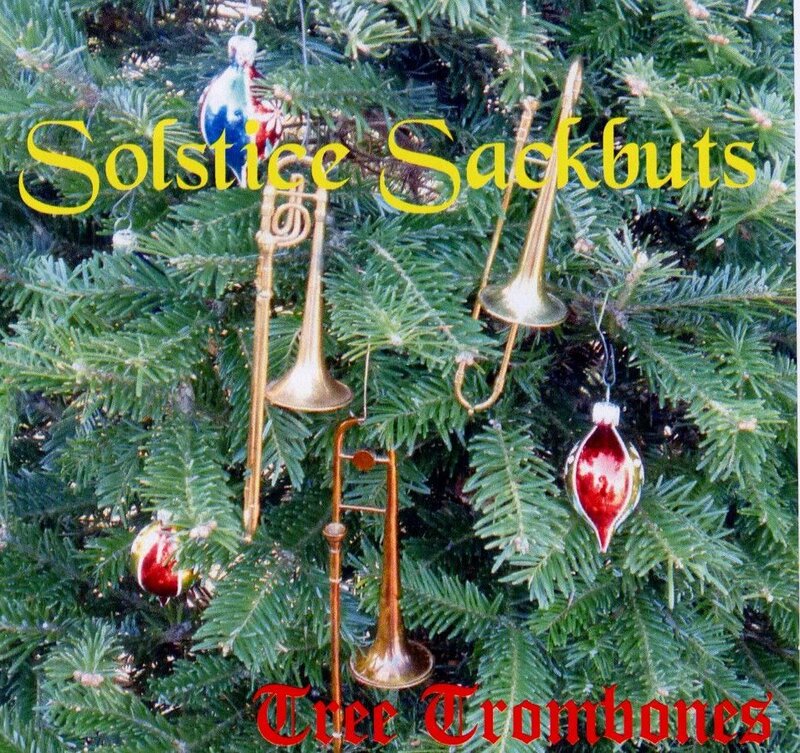 The Solstice Sackbuts perform on soprano, alto, tenor and bass trombones. Check out our different programs. Leslie Havens, of Waltham, MA, is a member of many groups, including the Diva Jazz Orchestra, with whom she’s recorded ten CDs, the newest having been nominated for a Grammy. With Diva, she has performed concerts and jazz festivals in Austria, Canada, Columbia, Croatia, the Caribbean, England, France, Germany, Greece, Holland, Italy, Jamaica, Switzerland, Turkey, the Ukraine and all over the U.S. She has performed in Carnegie Hall with Arturo Sandoval, with Aretha Franklin at the Newport Jazz Festival and has toured Europe and South America with Paul Anka. A member of the Artie Shaw Orchestra for ten years, she has toured the US, Brazil and Taiwan and is on the band’s only CD. She has performed with many other groups, including Barnum and Bailey’s Circus, Big Apple Circus, the Boston Brass Ensemble, the Monarch Brass Ensemble, the Tommy Dorsey Band, and has recorded CDs with her own group Quintessential Brass, the Jeff Holmes Big Band, Artie Barsamian’s Boston Big Band, the Boston Gay Men’s Chorus, the Abletones, and singer Ann Hampton Calloway (with Diva). She has also performed with Tony Bennett, Dave Brubeck, Natalie Cole, Jack Jones, Lorrie Morgan, the O’Jays, Bernadette Peters, Kenny Rogers, Frankie Valli and the Four Seasons and others. 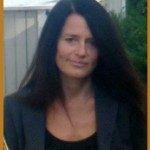 Leslie teaches private brass lessons at Bedford, Marlborough, Hudson, Sudbury and Harvard Public Schools. David Lindsey, of Randolph, MA, received a Bachelor of Science degree in Mathematics from New Mexico State University, and a Bachelor and Master’s Degrees in Music from Northeast Missouri State University. He has toured as a trombonist with bands led by Buddy Rich and Louis Bellson, and served as contractor/bandleader for many shows, including Ray Charles, Mel Torme, Eddie Fisher, the Temptations, Rita Moreno, Maureen McGovern, Johnny Mathis and Marvin Hamlisch. 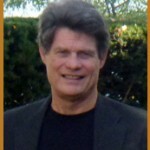 Formerly a teacher at Berklee College of Music, David now teaches piano and brass at his home. 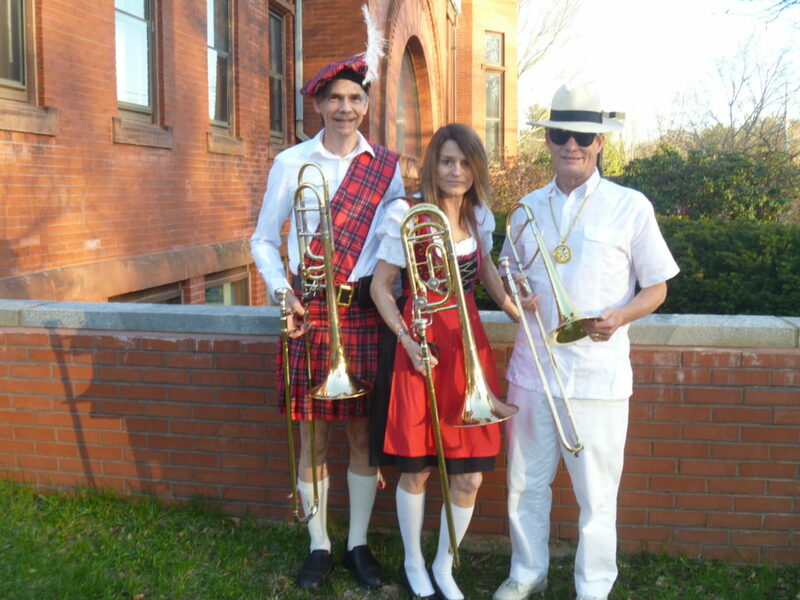 David is a member of Quintessential Brass and also leads the David Lindsey Quintet (party band), Basin Street Dixieland Band, and One O’clock Jump (swing band). He owns Royal Entertainment, an entertainment agency that represents all types of musical groups. Alan Johnson, of Waltham, MA, studied trombone performance at the University of Michigan with Glenn Smith. While living in Michigan, he toured Europe with the Midland Symphony and performed at the Montreux Jazz Festival in Switzerland. While living in Virginia, he performed with the Mclean Symphony and the Arlington Symphony at the Wolf Trap and other venues. A retired rocket scientist, Alan now performs with many ensembles and orchestras including Quintessential Brass, Blackstone Brass, the Brockton Symphony, the Claflin Hill Symphony, Symphony Pro Musica, the Worcester Chorus, in the pits of Turtle Lane Theater, Vokes Theater and the Longwood Players and has shared the stage with such artists as Annie Ross, Clark Terry, and Slide Hampton. Alan has performed productions of Oklahoma, Annie Get Your Gun, Sweet Charity, Seusical, Cabaret, Carousel, Sweet Charity and others. 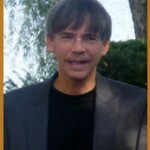 Alan teaches piano and brass lessons in Dedham, Hudson, Holden and Quincy. He is also the conductor of several youth groups.